(Tech Xplore)—A team of researchers at the University of Wisconsin has developed a pair of glasses that allows the wearer to have tetrachromatic vision. In their paper uploaded to the arXiv preprint sever, the group describes the inspiration for their glasses and explain how they work. Humans have three types of cone cells in the back of the eye to differentiate color. Some react to blue, some to green and some to red. The cones do their work by responding to the difference in wavelength of the incoming light. Such vision is known as trichromatic. In this new effort, the researchers have found a way of fooling the brain into seeing as if there were a fourth type of cone, by wearing glasses with two types of filters. The result is tetrachromatic vision. 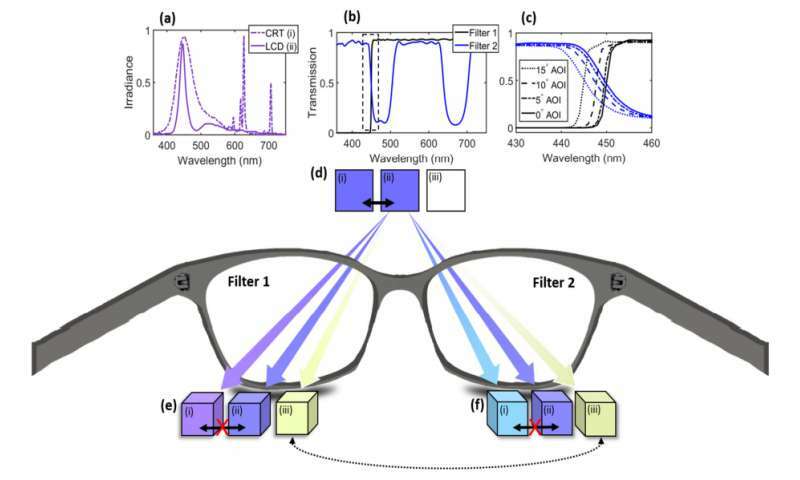 To create the glasses, the researchers fashioned two types of filters, one for each eye. The filters remove some parts of the blue light spectrum. But the filters each remove a different part. When the filters are fitted into a frame and worn like regular glasses, the wearer is able to see colors that are normally hidden—metamers. In a sense, it is rather the opposite of what occurs with people who are color blind. They might see blue and red as the same, even though there is more light information there. Adding spectrum identification to color blind eyes allows for seeing more of what is already there. With the new combined filter system, a person is able to look at what appears to be an object that is all the same color, such as purple, and see more colors in it—those normally hidden metamers. The team notes that it should be possible to extend the idea used to create their glasses to the other two colors that cone cells process, red and green, to create glasses that offer the ability to see six basic types of colors instead of the normal three. They plan to start with green. Such glasses, the team notes, might be used to spot counterfeit money, or to see a person in the jungle wearing camouflage. To see color, the human visual system combines the responses of three types of cone cells in the retina - a process that discards a significant amount of spectral information. We present an approach that can enhance human color vision by breaking the inherent redundancy in binocular vision, providing different spectral content to each eye. Using a psychophysical color model and thin-film optimization, we designed a wearable passive multispectral device that uses two distinct transmission filters, one for each eye, to enhance the user's ability to perceive spectral information. We fabricated and tested a design that "splits" the response of the short-wavelength cone of individuals with typical trichromatic vision, effectively simulating the presence of four distinct cone types between the two eyes ("tetrachromacy"). 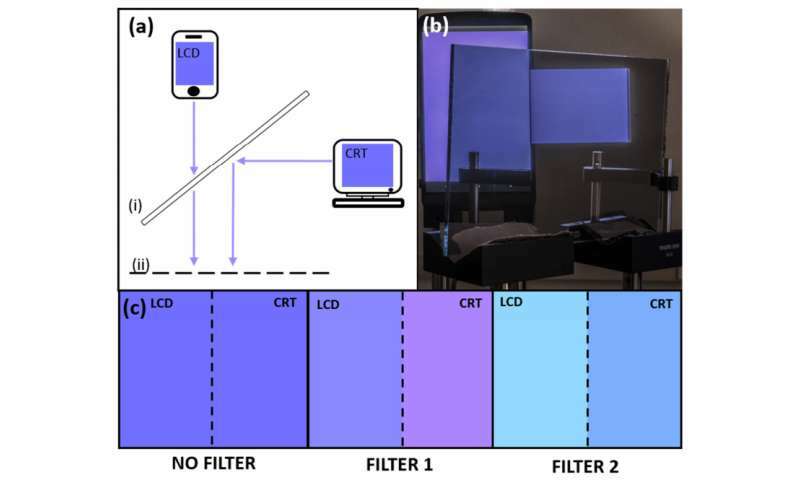 Users of this device were able to differentiate metamers (distinct spectra that resolve to the same perceived color in typical observers) without apparent adverse effects to vision. The increase in the number of effective cones from the typical three reduces the number of possible metamers that can be encountered, enhancing the ability to discriminate objects based on their emission, reflection, or transmission spectra. This technique represents a significant enhancement of the spectral perception of typical humans, and may have applications ranging from camouflage detection and anti-counterfeiting to art and data visualization. Don't a few surgeons already use something similar to spot the borders of carcinomas ? ?